This post contains affiliate links, which mean that while I am not paid to promote certain items, I will earn a small commission should you purchase items through these links. For more info, see my disclosure policy. The best part of sewing blogs is seeing what people have made, right!? I compiled all the things we made at Pin, Cut, Sew studio in May and boy, it's a lot. I'll start with what my sewing students made over the last month. We made colored pencil rolls using the tutorial at Create in the Chaos. These were a hit with my students and they were all able to do the sewing with little help since it's just a lot of straight lines. My other class made their own pajama shorts using Simplicity #8401. 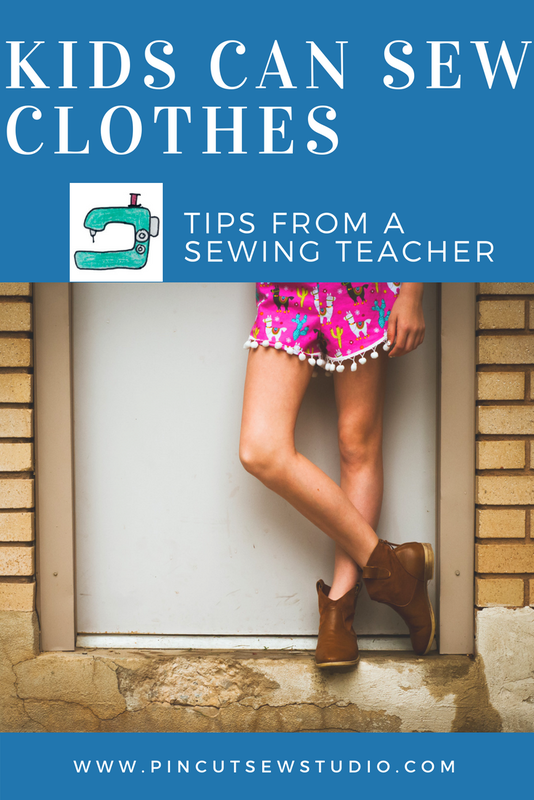 You can visit my post about teaching kids to sew clothing right here! That same class also wanted to make pineapple plushies on the last day of classes for the school year, so I came up with these cute little guys! They got to practice some embroidery and got creative with the faces. My other class, for the last day, chose to have a free sewing day, where they could come up with their own ideas and I could help bring them to life! These two siblings came up with some super cool ideas! John made a golden snitch with a zipper case for it and Alex made a pillow to give her parents on their anniversary. My third student in that class made a doll skirt and shirt and a doll tote bag, but I forgot to get a photo (bad sewing teacher!) I do have a tutorial for that doll tote bag right here, though and tips for sewing doll clothes right here. Stay tuned for a tutorial on making skirts for any size doll! I think that's it for my classes for May, so now let me show you some personal makes! I don't always sew this many garments in a month, but there were some holes in my Summer wardrobe so I got busy. I definitely sew more of my Summer Wardrobe than I do my Winter wardrobe. I guess I have no desire to make jeans or sweaters, ha! I'll start with the most recent make because it's a new favorite. I made yet another Blackwood Cardigan and it's my best one yet. Actually the next three photos include makes from this pattern, so you could say I'm obssessed. I don't buy a lot of indie sewing patterns, but it's safe to say I've gotten my money's worth from this one! This next one I made awhile back. I didn't have enough fabric to make sleeves, so I made it a vest instead. Both this fabric and the stripe above are from GirlCharlee.com, a great resource for knits of all kinds. I made this gray tank too, from a pattern I drafted from a ready-to-wear tank. Fabric is from Hobby Lobby. I liked that one so much, I pulled out another knit I didn't have a whole lot of (I actually bought it from a thrift store) and made another Blackwood vest. This knit is thicker and it turned out with kind of a utility vest vibe, which I dig! Next up, this is my favorite top! This organic cotton double knit has been on the clearance table at Joann literally since I moved here a year ago, but it was still super pricey. It finally went down in price another notch and I bought a yard. I used a tried and true pattern, Very Easy Vogue 9109 and I love it so much. My next outift includes two handmade pieces. I wanted a higher waisted crisp denim skirt. I grabbed the perfect denim at a Joann sale and used a Cynthia Rowley pattern, Simplicity 1783. I almost always Cynthia Rowley's designs and this one turned out great! 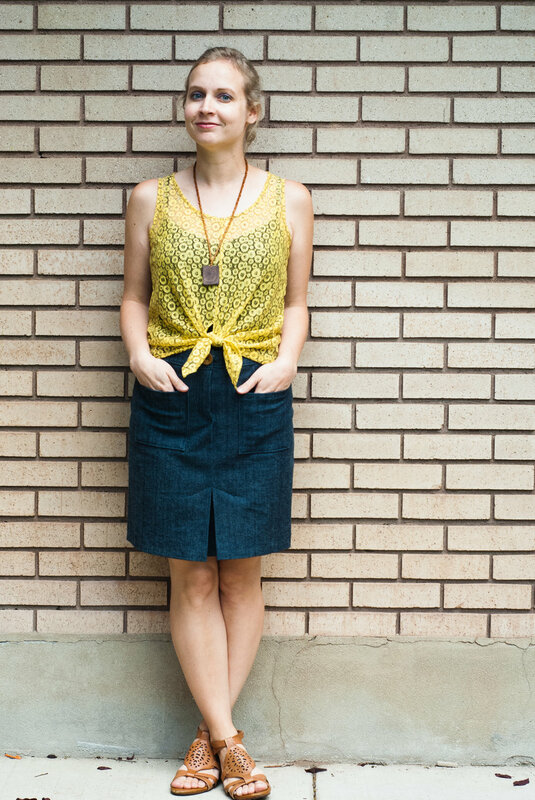 The yellow lace tie top was made with a mustard lace I'd had in my stash for a couple years and I used the new pattern, Simplicity 8601, eliminating the sleeves and lowering the neckline. I like this look and my fashionista daughter said it's her favorite, so I think it's a good one! I really needed some basic tanks, so I snatched one yard of this rayon jersey at Joann and used the free pattern by Hey June called the Durango Tank. I highly recommend, the cut is great and you can't beat free! Be sure and check out her other patterns too. This is another outfit with two handmade pieces. 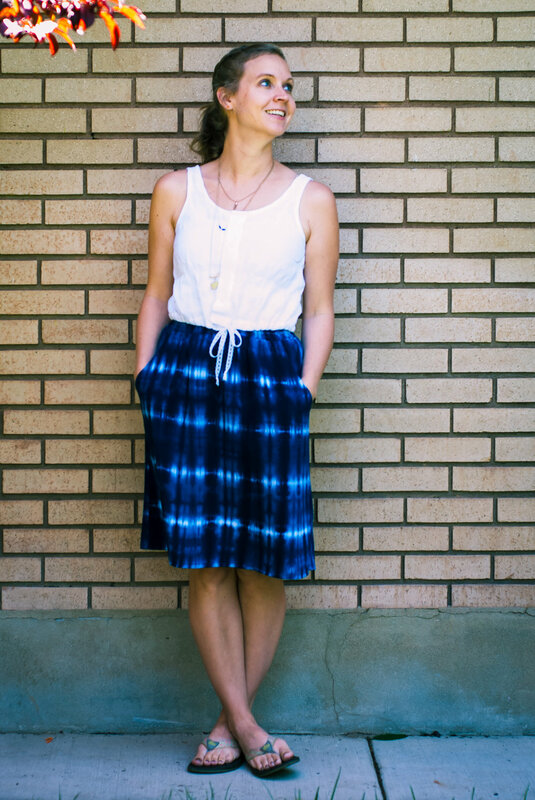 The skirt is a very basic pattern, New Look 6436, and I love the pockets! The top is McCall's 7603 and while this is not my first attempt at it, but it is the first version I've loved. It just took some time to get the fit right, because it runs large and I don't like the pleat in the back, so I'll now eliminate that altogether in the future. Now that I have it how I want it, I can see a few more versions! Both these fabrics are from Hobby Lobby's Spring Fashion fabric line. Lastly, I made a couple pair of rayon shorts using Kwik Sew 4181, which is really an activewear pattern. The shorts are super cute and comfy, but they're a bit too short for me to be comfortable wearing out. But the pattern is great and I'll definitely give it another try and lengthen it! For now, these shorts were awesome for the two days we spent outside building a chicken run for the ladies (by ladies, I mean hens. It occurs to me you wouldn't know that if you don't follow me on Instagram). This pair is a rayon denim from Joann (such dreamy fabric!) and the pair I didn't get a photo of is out of a textured black rayon also from Joann. 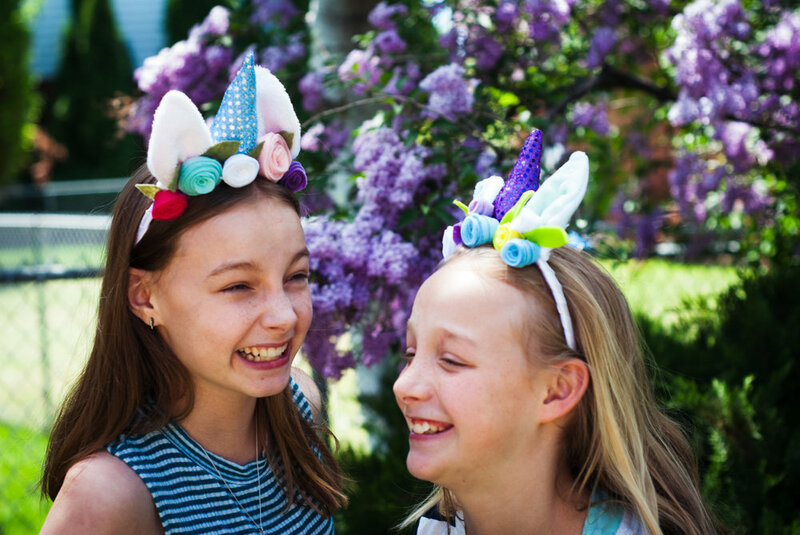 One last thing, I remembered, we did make these cute unicorn headbands in May! Find our easy tutorial here. I have had no fewer than three people lament to me that they wish they could read a sewing pattern in the last week! Two of them were mothers of my students, who can thread a machine, but are lost when it comes to helping their children sew, and the third was one of my older students. Clearly the world of patterns is confusing to beginner sewists, so I am taking it upon myself to try and clear up the confusion! This is part one of what will be a five or six part series over the next few weeks. Today's topic starts at the very beginning. There are so many sewing patterns, how do you even choose? Let me state up front that the patterns I'm referring to in this series are the kind you'll find at the fabric stores by companies known in the sewing world as "The Big 4" (also the title of an Agatha Christie book I'm currently reading, incidentally, ha!). McCall's, Butterick, Simplicity/New Look and Vogue. There is an entire industry of "Indie patterns" out there, but these are quite different and much more expensive than you can find at your local craft store, although there are many great things about those patterns too. If you're brand new to patterns, keep it super simple. 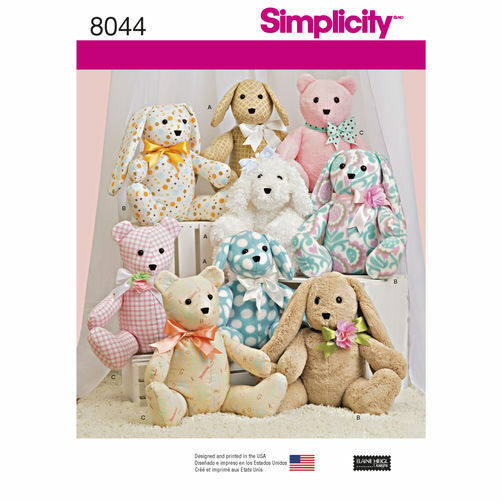 For our purposes in this series, I'll be using Simplicity pattern # 8401. I've recently sewn this pattern with my students and know that it only has two pattern pieces to make a pair of cute shorts! There are another two pieces for a pair of doll shorts. If you're wanting to start with clothing, choose something basic and take note of fancy elements, such as zippers, button holes, pleats, godets, etc ... I'm not saying steer clear of those elements, but I may be saying, choose a pattern with one new-to-you concept and not five. If you add one new skill per project, you'll be a pro in no time! Pro Tip #2: Just because a pattern says "Sew Easy" or something similar, doesn't necessarily mean it's true! Look at the line drawings on the back of the envelope to give you a better idea of what's involved than the photo on the front of the envelope will, and then decide what you're willing to tackle. So, once you've chosen your pattern, spend some time on the back of that envelope. Other than those helpful line drawings, there is lots of important info back there. The top box should tell you which kinds of fabrics the pattern is suitable for. Don't obsess too much over this, but for sure don't choose a knit (stretchy) if the pattern is made for woven fabrics (non-stretchy). Also, if you're making a flowy skirt, don't choose a stiff quilting cotton unless you want your skirt to stand out like a tent around your body. This part is somewhat intuitive and comes with experience and trial and error. The next box is the sizing chart. I cannot overemphasize that pattern sizing is very different from ready-to-wear sizing! If I wear a 6 or 8 at Target, I'll probably sew a 12 in patterns. This topic requires a post by itself, so stay tuned for part 2 of the series, coming in a few days! Next, there is a box that tells you how much yardage to buy based on your size. If your pattern is say, for a lined skirt, the box will tell you how much you need of both your skirt fabric and your lining. If you're making a garment with two fabrics like a top with a lace inset, the pattern will usually refer to the accent fabric as the "contrast". This section also tells you which notions are needed for each view, although sometimes the notions get their own little box. Our shorts pattern says that the girls' shorts need 1" elastic and the doll pair requires 1/4" elastic. It also tells me how much trim we need. You may want to buy a smidge more fabric than required to accommodate for either shrinkage or cutting mistakes. One more thing about the fabric requirement. You can see my pattern says different amount of fabrics for either 45" or 60". This is referring to the width of your fabric. If you choose a quilting cotton for example, the width will be 45" wide, but most linens and denims and also many knits and other types of fabrics come wider. The end of the bolt of fabric will give you this information, along with the fabric content, the washing instructions and the price. Actually, those wider fabrics tend to say 58", not 60" like we always say they are, but at any rate, they will still work for those 60" fabric requirements. Just thought I'd mention that in case someone is standing in the sewing store with a bolt in their hands wondering why they can't find anything that says 60" wide! Pro Tip #3: You can find fabric or even sheets at thrift stores to try out your pattern with if you want to do a practice run. We can this "making a muslin". This way you can figure out the fit without worrying about messing up your good fabric. I think that sums up the pattern as far as the outside of the envelope! Be sure and come back for part 2, (Part 2 is here!) in which I'll attempt to unscramble pattern sizing for you! Last week I moved some new sewing books from my Amazon wish list into my cart and then I tossed a third one in there because it was on super sale and that ended up being the one I'm most excited about! Since that super sale may not last long, I'll tell you first about Superhero Sewing, by Lane Huerta. You guys, this book is SO FUN and super cute and it's on sale on Amazon right now for $8.88!! It's regularly $24.99, so this is a great deal. 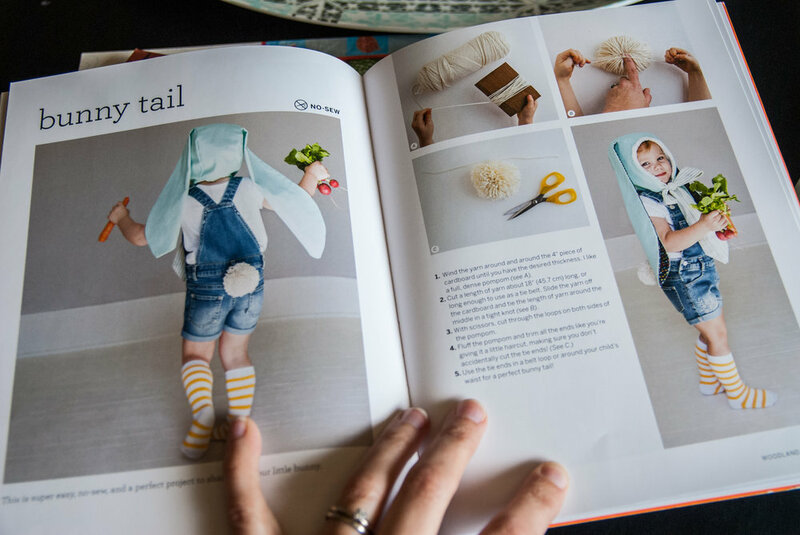 If you have little people in your life, (or heck, big kids like my 13-year-old who just said she wants the rabbit hat out of this book), or if you are looking for fun ideas to sew for or with your kids, this book is so adorable and all the projects are super easy. It looks like many of them are made out of felt, which simplifies things even more. No fraying edges! Some of my favorite dress up items in the book are the pirate set, complete with hats, eye patches and a pirate ship's flag, the magician hat (with bunny and never-ending flag trick! ), and the woodland creatures. The rabbit is just to die for. Another way I can see this book being useful is to use the base patterns to create other costumes. I made multiple Narnia creature costumes for a play our homeschool co-op put on this year and I used the same hat pattern to make all the animals, just changing up the fur and ears. This book includes great patterns that can easily be adapted to make other things. The best part is, my youngest students can handle these projects and they would be so excited to make dress up things. I can't wait to show it to them next class! Next up, Making Faces in Fabric by Melissa Averinos probably wouldn't have been on my radar as something I'd like to try if I hadn't stumbled on Kristin Shields' example and this photo on Instagram of Thread Sewing School's students' finished faces. These are amazing! I've since started following the author, Melissa Averinos on Instagram and am so inspired by her work. While sitting outside with my hens today, I was able to skim through the steps and I am truly excited, not only to try this myself, but to teach it to my students. How fun would it be for them to make their own self portraits in fabric!? The thing I like best is that she includes thorough, but not overwhelming instructions for drawing faces and where all the parts go and how to make noses that don't look dumb (ha!) so this book is not just for those who consider themselves artistic, it's a way to grow as a fabric artist and get really creative. Last but not least, I have long been a fan of the Sewing School series by (not to mention, we absolutely love Baking class and have Cooking Class on our wish list!) so when I found out there was one I didn't have, I ordered it right up. Sewing School Quilts, like the others in the series, is written for kids, not for grown-ups, in words and pictures that make it easy for them to complete projects with minimal help. However, there are tips in the front for quilting with kids in a group setting and I love the idea of hosting a quilting club for my kids to invite their friends! Because this is a kids' book, the projects in the book are made by kids with all their glorious imperfections! 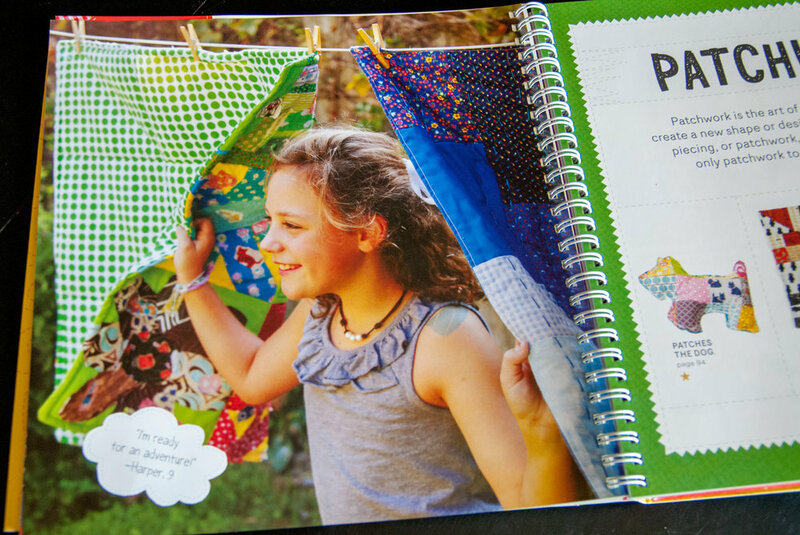 The book offers ideas for projects that kids can make on their own or in a class or at a sewing party. Super fun. That's it for now, I can confidently recommend each of these books. I have several more on my radar that are coming out in the next few months, so I'll keep you updated as I add to my collection! The weather is warming up and we've been making shorts! My afternoon sewing class on Mondays has been itching to make clothes, I could tell. This can be hard in a group setting, but pajama shorts were something I knew we could manage and I'm so glad we did! Natalie made up a pair just for fun using Simplicity 8401 and it's such a simple pattern, I knew it would be perfect for my students. Plus, it includes a matching doll shorts pattern! This pattern takes just one yard of fabric and has only two pattern pieces! I've made pajama shorts with sewing classes before and we used a Jalie pattern that was much more complicated (although very nice). This Simplicity pattern was easy to fit and easy to adjust by taking in the side seams if they were too large. 1. Size up. I either take measurements beforehand or ask their moms to send me the needed measurements so I'm prepared with the right sizes. It's easier to make smaller than to make bigger, so if someone is in between sizes, I go up! 2. Explain pattern sizing to them. 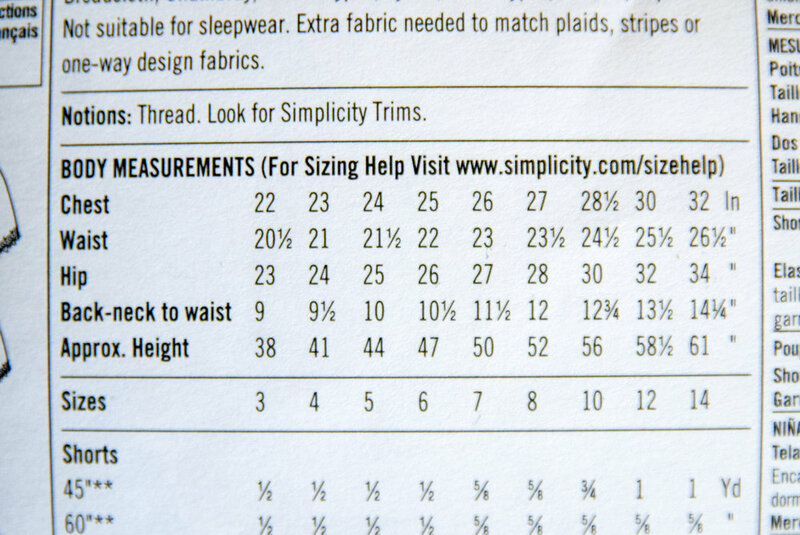 Make sure they know that pattern sizes are different than ready-to-wear sizes. If you have a child who may be sensitive about the number of the size she is sewing, do what you can to make sure she knows that the number doesn't mean much. This can be hard, I know. To avoid the issue altogether, I've sometimes traced patterns and put only their names on them and NOT the size that I traced. Everyone gets their own pattern and no one has to dwell on what size it is. Instill in them that the beauty of sewing is that we can make things to fit our own unique bodies! My 13-year-old, who has a hard time finding dresses off the rack to fit her long and lean frame, sews a size 10 in patterns, but with a size 16 for length! 3. Give them one step at a time. Sewing garments can seem very abstract to someone not used to it. When sewing with one of my own kids one on one, we do read the instructions and I help them understand step by step, but in a group setting I offer one step to the class at a time and we do our best to stay together. It seems like ages 12 and up are better able to understand pattern instructions than younger ones, in my experience. 5. Explain useful terms as you go. For example, when cutting, show them the arrow that goes with the grain line and with the selvedge, and why you want the stretch to go across your body, not up and down. Don't bog them down, but help them learn terms that will be useful for next projects, like hemming, edge stitching, basting, casing, seam allowance. That kind of thing. Help them learn the lingo and they'll better be able to attempt using patterns on their own! I'm already brain storming more clothing projects because these girls really loved making something they could wear and most said this was their favorite project so far. Layla thinks circle skirts would be fun! I own the books #ootd and Girl's Guide to DIY Fashion and they both have some promising choices. I'll let you know what come up with! Unicorns are all the rage right now! I have an 11-year-old daughter who's a tad obsessed. 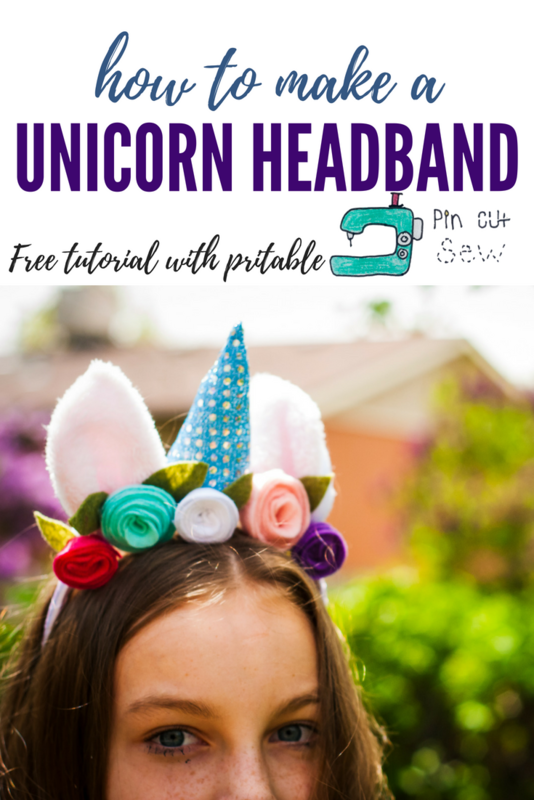 I thought a unicorn headband would be a fun DIY project to post a tutorial for. My 13-year-old got to work a couple days ago and made one together, the Layla whipped one up today. Super fun! Before you get started, you'll need to grab this free pattern. Just click on this photo to make it big, then right click to save it to your desktop. From there, you should be able to print it (make sure you click "fill page"). As for fabrics, anything goes! We used small scraps of some sparkly costume fabrics, some fleece and novelty fleece we like to call "Flur", and felt for the flowers. You'll also need a headband. Ours was the wrong color, so we wrapped it in ribbon, but that's optional. This project can easily be sewn by hand (there are only a couple small sewing parts) if you don't use a sewing machine. A glue gun is also a must. 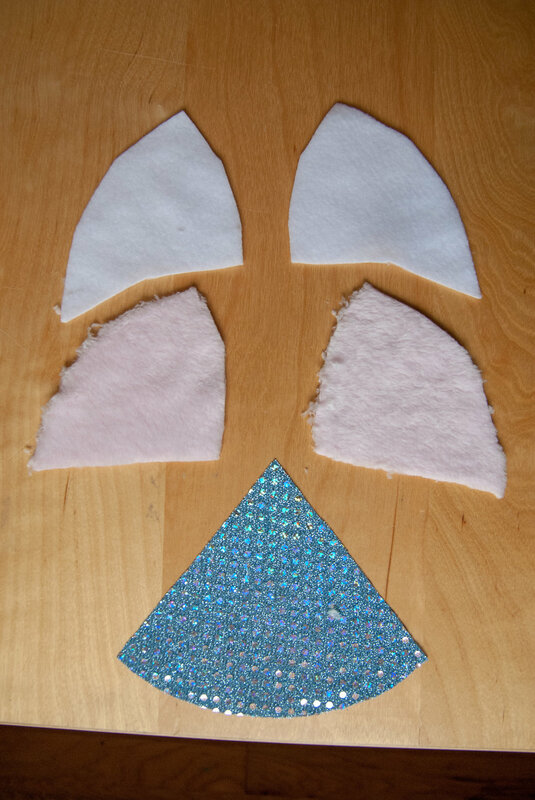 Start by cutting out one horn and four ear pieces total, two from your ear back fabric and two from your inner ear fabric. You can cut two at a time, but make sure your ear face the opposite direction from each other, if that makes sense (see photo). Then pull it tight, creating a flat-ish bottom. Knot and trim your thread. 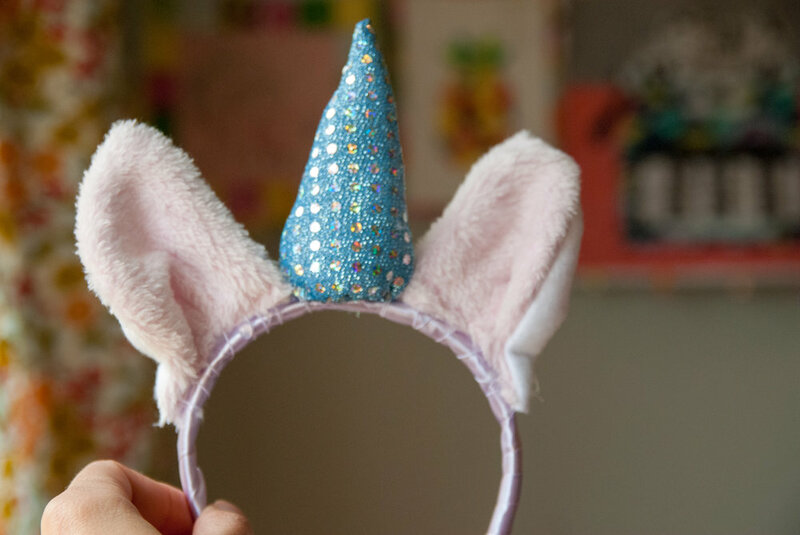 To make the ears, place your outer and inner ear pieces right sides together and sew the sides, leaving the bottom open. Clip your corner and turn right side out. Now, to shape the ears, for our first version, we sewed a pleat, but ended up shaping them further later on by folding the outer edge in toward the middle. So when Layla made hers, she folded both sides in toward the middle and sewed across the bottom and we liked that better. Just do what you think looks best. At this point, if you want to wrap your headband in ribbon, start by gluing the end of the ribbon to the bottom of the headband and then wrap it diagonally around until you get to the other end. It's fiddly to get started, but just do your best. Then we glued the pieces on, first the horn to get it centered (be sure and put the seam facing the back! ), then the ears. The glue alone isn't secure enough, so next, thread a needle and sew the pieces, as shown in the photo. Next, the flowers! These are so much fun to make, my girls have been making them just for fun now for two days. There are plenty of felt flower tutorials out there, but we think these are the easiest kind and perfect for this project. Find a couple circles to trace onto felt. Ours ranged from 2" to 5" in diameter. Cut out your circle and then cut it into a spiral, about 3/8"-1/2" wide. Then, just start wrapping it around its center, ending with a dot of hot glue. That's it! I takes a little practice, but it's pretty simple. 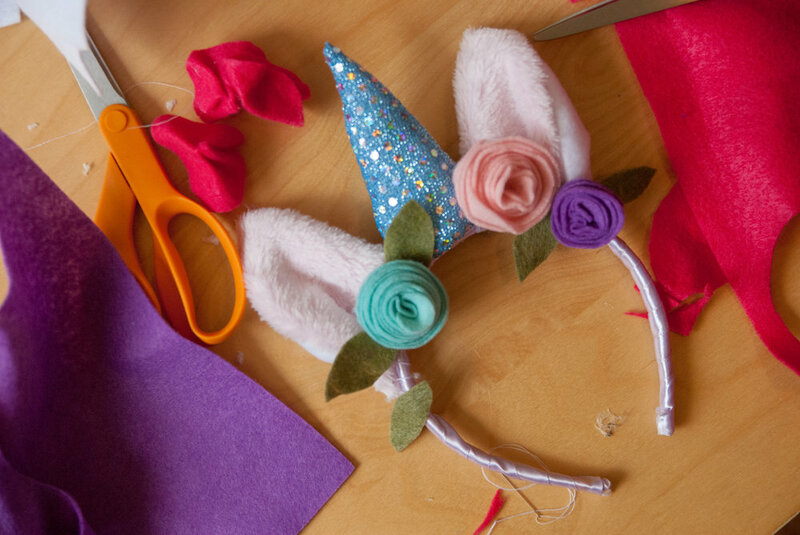 Cut some leaf shapes and arrange your flowers and leaves over your horn and ears before hot gluing them down. I hope you enjoyed this simple tutorial! 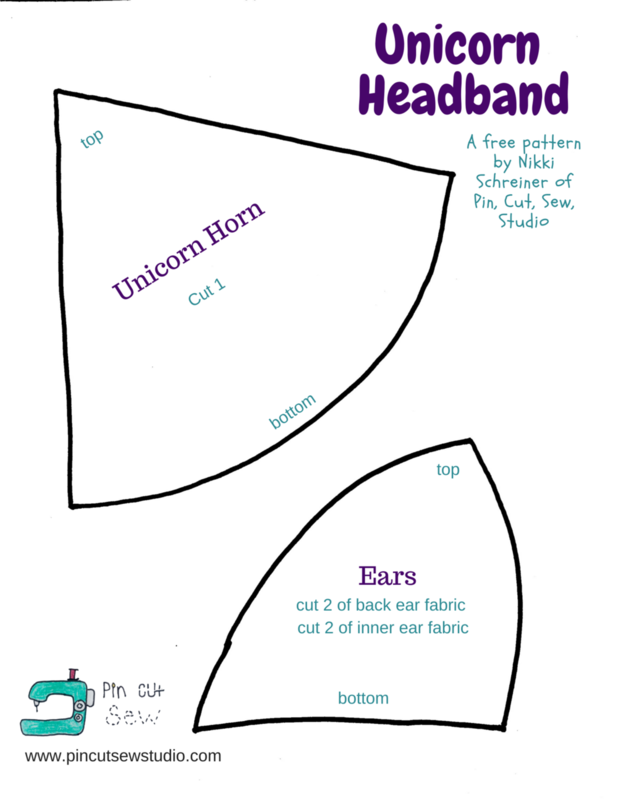 If you made some unicorn headbands, I'd love to see them! And for the unicorn lover in your family, we recommend this cool book. Layla has really enjoyed it and has read some parts to us during our home school. I've been teaching kids to sew for a couple years now, have had well around 80 children come through my studio and finish projects successfully, so it's about time I share some tips with you, whether you're wanting to sew with your own children, or teach others. 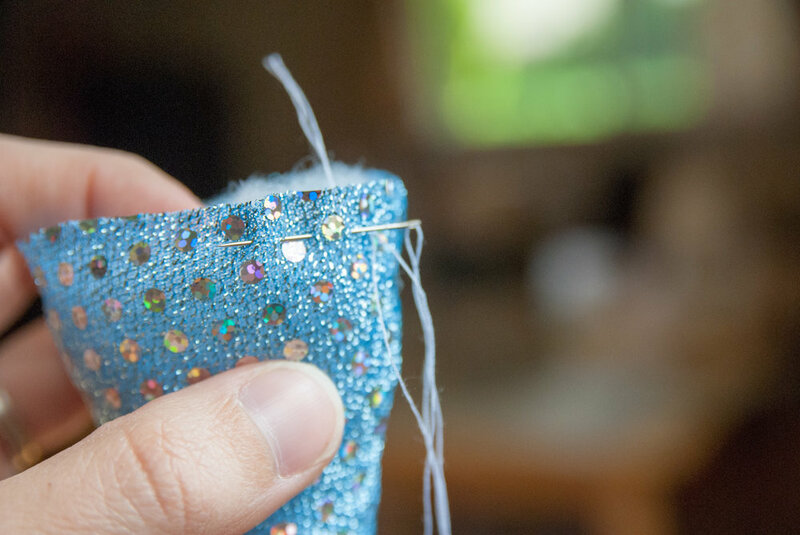 And if you desire to help your own kids learn to sew, but don't have sewing skills yourself, this post is just as much for you as it is for the pros! I'm going to jump right in! FIRST, gather quality tools. I get asked very often by the mothers of my students and others for my recommendation on a beginner sewing machine. My advice is and has always been, DO NOT buy the cheapest machine of any brand. You will only be frustrated. If you've made this mistake and have had lots of problems, let me reassure you, it's not you, it's the machine! That said, a good machine doesn't need to break the bank. I use this one in my studio. I have six of them and they've been dreamy. Here is more on why I like them and why I upgraded from the ones I used to teach on. 1. Scissors. I've used many kinds in my classes, but realized the kids were always scrambling for dibs on the regular orange Fiskers scissors. For some reason, they just don't dull or get out of whack like all my other brands did. So now I have six pair of the Fiskers and also the Fiskers sharpener. This eliminated our scissor woes. I also noticed that my younger students sometimes have trouble with cutting and ordered a pair of the Fiskars for small hands. That solved the issue for most littler ones! 2. A good seam ripper! Unsewing is a necessary skill, so get a good sharp unsewer and replace it when it start to slack off on the job. 3. Pins. You don't have to be too picky about these, I like quilting pins because they're longer, but any pins will do. Along these lines, Wonder Clips are wonderful to have on hand, although totally optional, because they are sometimes easier for kids to use and they don't get poked as often. 4. Pin magnets. I use plenty of pin cushions on my classes, but have a pin magnet next to each machine and they're nice because they make it so easier to pick up the piles of pins left on the table and even on the floor! Plus, the kids just think they're fun. 5. Fabric! Ok, I know this is obvious, but what I want to say about it is that kids will take to sewing much more gleefully if you have some cool fabrics in trendy prints. Think, cactus, llamas and unicorns! The hand-me-down quilting fabrics from the 80's or that box of polyester suiting you were "gifted" from a well-meaning person who found out you sew ... these won't go over quite as well. Let your kids pick out some fun prints, have lots of felt on hand and see what they can do! 6. Stuffing. When told they can sew whatever they want, kids will sew a pillow or a stuffed something 99.9% of the time. Ha! Have stuffing. I keep the big box of polyester fiber-fill on hand. I use a coupon from Hobby Lobby or get it at Wal-Mart (for some reason, it costs a ton more at JoAnn's). SECOND, don't teach them everything at once. Others may have another method than me, obviously, but I don't teach the kids to thread the machines when they're brand new. I teach them to use the machine by going around a sheet of paper, learning to backstitch, stop and pivot, etc ... and then we get down to our first projects. I have found that the older girls pick up the threading as they watch me thread and before long, they learn how to do it naturally. Choose projects that build skills incrementally and let them come up with their own ideas too. Before long, they'll start to understand more and more about construction. THIRD, try not to micromanage. Many moms have a tendency to hover, overcorrect and criticize when their kids are learning to sew. Please don't worry so much about "wasting supplies" or not having a perfect outcome. The reason I teach kids and not adults as much is because kids are always just so proud of what they've made! They don't see the flaws, they are just thrilled that they produced something. And when something's a total disaster, they're always willing to try it again, having just learned how not to do it. Relax, moms! ;) Keep your cool. Teaching children a skill like this requires a lot of patience and positivity. FOURTH, provide them with inspiration! This is the fun part. 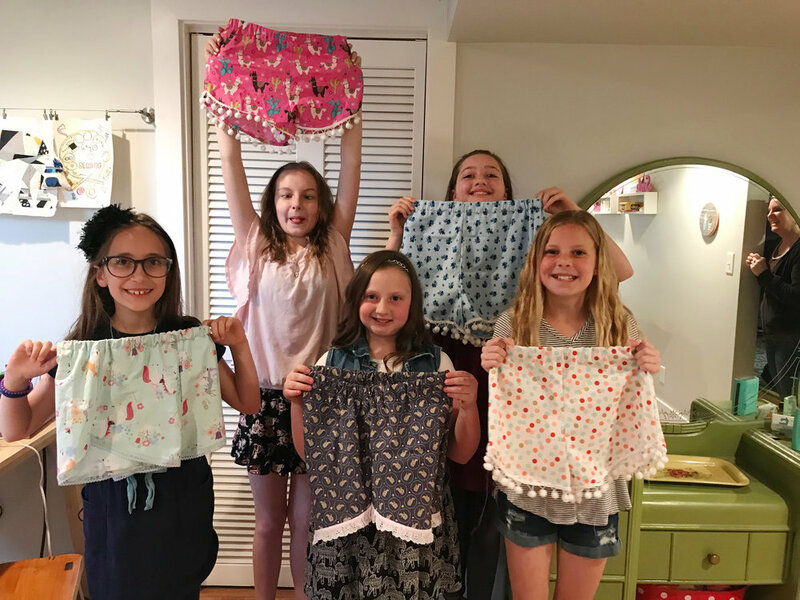 There are so many great projects out there that kids can attempt to make on their own, once they know the sewing basics. 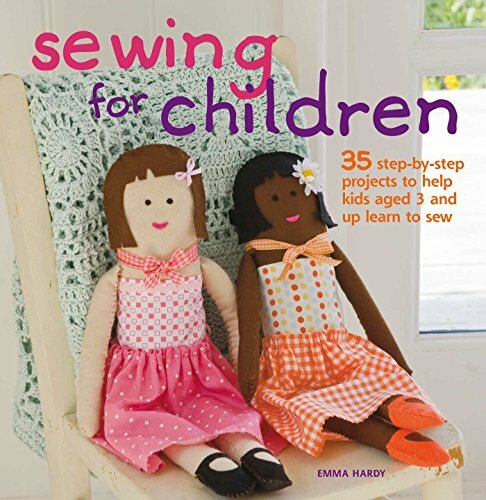 I know I've mentioned several of my favorite kids' sewing books in various posts, but a few of my favorites are Sewing for Children (perfect for brand new beginners, younger learners or hand sewers), and the We Love to Sew series. There's so much good stuff on YouTube too, including my channel, Pin, Cut, Sew, which I try to keep very beginner friendly! Pinterest is a well spring of ideas, of course. You can follow my "Kids Can Sew" board and find plenty of ideas. In class recently, we made hoop art (check out their creations in the photo below!) and had Pinterest open browsing for hoop art inspiration. So I even use Pinterest in my classes! I hope this has helped some of you and given you courage to give sewing with children a try. I know there's a lot of logistics about what classes actually look like that you may have questions about, so I'd be happy to help answer those the best I can if you'll ask me! Well, hello there, readers! I know it's been some time since I have posted. I let my life fill up just a little too much this past school year and I found I just did not have time or energy left to post anything remotely helpful for you. But we wrapped up our school year and I am excited to start sharing here in this space again! To update you on life here: I am still teaching sewing to kids and I am still sewing with my own kiddos. I am not currently creating sewing tutorials for YouTube, but it's not something I've decided to totally give up on, so we'll see in the future how I feel about that. I am glad those videos seem to be helpful to so many, though, according to the subscriber number! I am still sewing many of my own clothes and my kids are all still sewing as well. My oldest is starting to learn to use patterns and make clothing too, which is so gratifying for us both! These were pretty fun. I had quite a stash of jeans that the girls had outgrown and a couple pair of Casey's and mine, but they all chose the purse sized girls' jeans. They all turned out so differently! I have been a long-time jeans upcycler. One time, probably fifteen years ago now, I made a library bag out of jeans and I have flat put that thing through the wringer with heavy loads of library books and it is still going strong! I thought I'd round a few good jeans upclying ideas that I've coming across recently while pinning ideas for my classes to use up this pile of jeans! The Brother Sews blog has this great idea to make a modern looking tote bag out of jeans legs. I like this because it's non-cheesey looking and you don't even have to line it since the hem makes the top of the bag and the inside seams are bound with bias tape. Cool! 2. 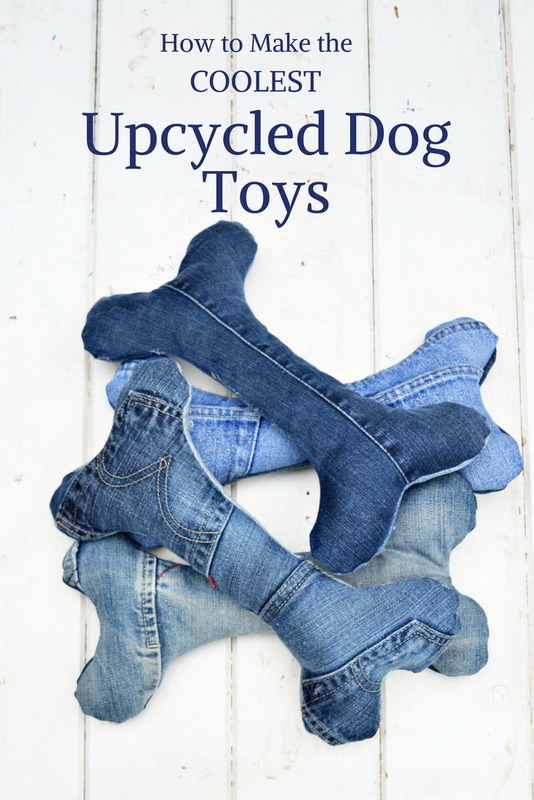 I absolutely love these adorable bone shaped dog toys out of old jeans. We know they'd be sturdy too! 3. 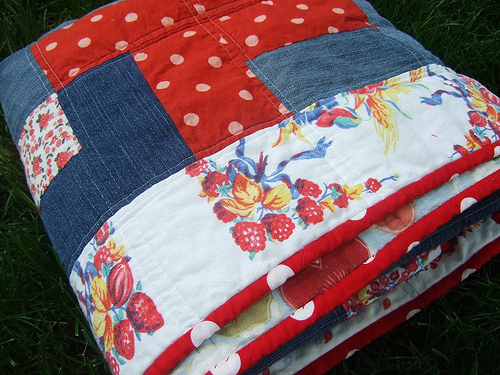 You would have to have been following my sewing adventures for many years to remember this picnic quilt I made out of upcycled denim and cotton. The borders are vintage tea towels and the back is a sturdy tapestry from Urban Outfitters. These photos are from 2010 and this quilt is still going strong. We use it constantly, it just lives in the car. 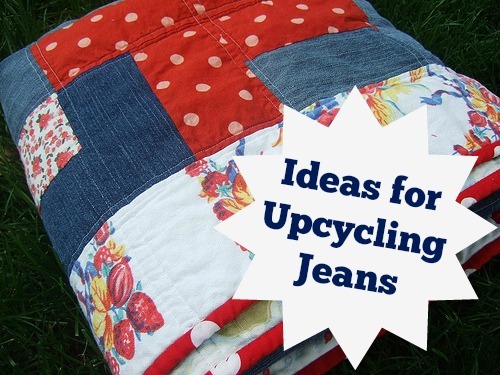 So turn those old jeans into a picnic blanket! 4. If you search for denim teddy bear on Pinterest, you'll see how cute a teddy can be made from old jeans! Here's a great pattern to use. 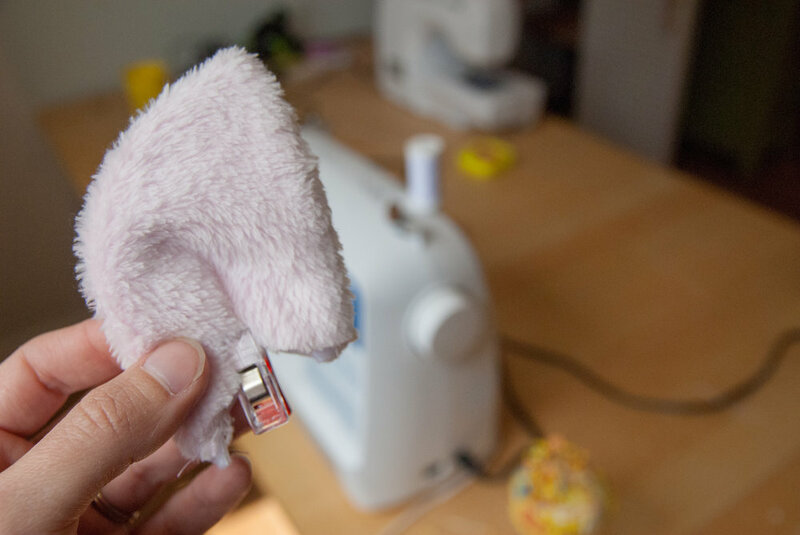 Teddy bears are not hard to sew at all, they're usually just two pattern pieces. You will just need some animal eyes, which are super easy to install (and are not the choking hazard that buttons would be, if gifting to a little one). Fabric flowers. The way the fabric frays make these extra cool! Do you have any more ideas? What kinds of things have you made from jeans? 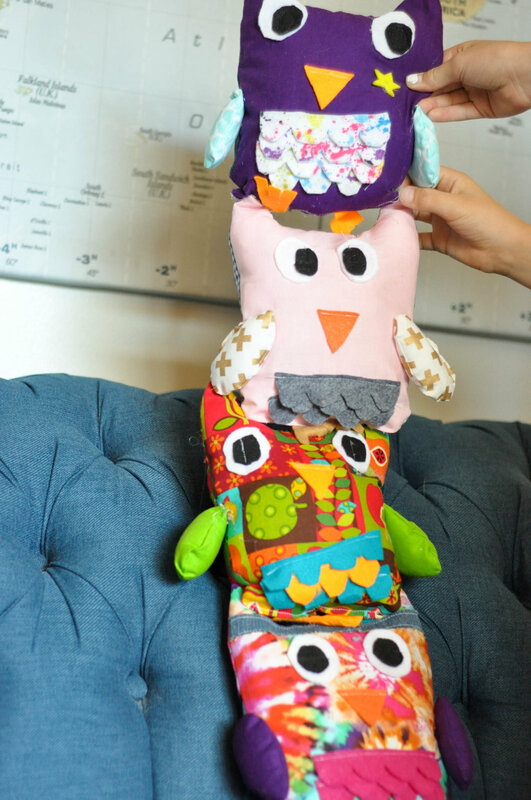 Kids can sew owl softies! My Monday class girls chose this cute owl softie from the book Sewing for Children to make this past week and they turned out so, so cute! I didn't manage to get a photo of my students' finished projects, but I did get some of the owls my kids and I made, after the fact. Here's mine. Because who wouldn't want to sew along while teaching this class, right?? I made mine a feathered headband. Should I call him Woodstock? Is it even ok for a bird to wear feathers?? My girls almost always join in on sewing class, but my son tends to wait until after class to make the projects that appeal to him (just too many girls, I guess) and he cut his out and sewed it almost all on his own! And whenever one machine became unthreaded he would just switch to a different one, lol. Sewing is a good skill for boys to have too. In the book this is a hand sewn project, but we did ours by machine. We've made several things from this book over the years. It was one of the first kids' sewing books we got, long before I started teaching sewing. My kids were able to make many of the items without help when they were younger! I'd call this one worth buying. **This post contains affiliate links, which means I receive a small percentage when you purchase through these links. I only recommend things that I own, use and love! Hello, strangers! Ok, I know it's me who's been absent, but that's because we have moved across the ocean. Before we left, I filmed two tutorials, hoping I'd get to work on them during the travel. Our stuff arrives tomorrow, six weeks after getting packed up, and I just now finished the first video, ha! It's a good one, though! You may have seen these cute triangle pouches around. I tried a few tutorials, but none were quite right, so I perfected the method for myself and Natalie and I filmed the how-to. These are super easy! We made them for dance teacher gifts, Mother's Day gifts and some for ourselves too. Small: 4x7 for bag pieces and 2.5x6 for handle. Medium: 6x11 for bag pieces and 3x7 for handle. Large: 8x15 for bag pieces and 3x9 for the handle. 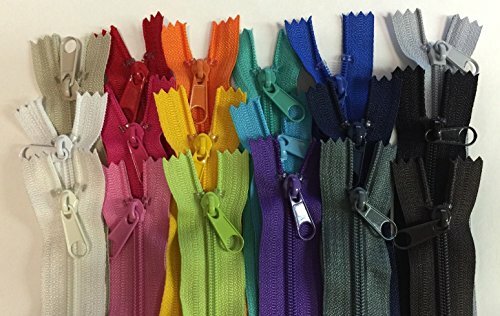 Also as referenced in the video, here is the link to my favorite zippers! They come in packages of various colors and are so much fun. Without further ado, here is our video! Don't forget to subscribe to our YouTube channel and be sure and show us what you've made using our tutorials by tagging me on Instagram! How to make an emoji sleep mask. Free pattern! We have a some long flights and accompanying jet lag in our near future and Kelby and I wanted some sleep masks. We thought emoji sleep masks would be super funny! Everyone needs a chuckle on a long flight, amiright?? Enjoy our video tutorial and you can print the free pattern below the video for both sizes of sleep masks! I love putting a little something handmade into my kids' Easter Baskets, but I haven't had a lot of time to think about it until now! So I got on Pinterest tonight and my goodness, there are some super cute ideas and a lot of them don't take much time at all. But first, just for grins, because I would't call this a last minute project, but my bunny basket I made last year is just too cute not to include in an Easter sewing post. This is an ancient McCall's pattern. It includes all holidays. I used to make these for gifts when I was a teenager and stash cute things in the basket. Aw :) I do think, even without the pattern, something similar to this would be easy to DIY for those who love getting crafty with felt and their glue gun. 1. Carrot Treat Bags. So cute! This is the one I'll probably whip up for my own kids. I think it would be fun for them to make for their friends too. 2. Drawstring Bunny Bags. Equally adorable. 3. Little Bunny Sachets, how cute. 5. I made several of these patchwork Easter eggs many years ago. Here's a photo I scavenged up from my old blog! My photography skills have progressed. Haha. 6. Oh my goodness, a bunny bib!! So sweet. 7. My kids would love these little love bunny softies. I think I may use this tutorial in a future sewing class. I think kids would enjoy making them even more than receiving them! 9. Some hair bows to match Easter dresses are always a good idea! Watch my video tutorial here. 10. And of course, if you missed my felt Peeps bunnies tutorial, they're super fast and easy! You could make a bunch to dress up Easter baskets. I feel like I haven't checked in here in a little while, but things are really ramping up for us as our move approaches. We are an Army family, in case you didn't know that, and we are moving from Hawaii to Utah. Our movers come in 34 days, eek! We have about six weeks left on this beautiful island, but we know that Utah has just as much beauty and adventure. So, we're currently attempting to buy a house from about 3,000 miles away. If you have bought a house site unseen, please share your positive experiences in the comments. If you have negative experiences, though, I'd probably rather not hear those, hahahaha! I held my last sewing classes here last week and that was a sad bit of closure for me. I've loved teaching sewing here so much and will miss my students a ton. I'm so happy to have passed the sewing bug on to so many kids, though, and I can't wait to meet the students I'll have in Utah. Oh, our house, God willing, will have space for a sewing studio so that I no longer have to set up sewing camp in our dining room and pretty much take over the house every time. I can't wait for that! I hope to set up a great space to film videos for the YouTube channel too! So, on to the new video! Oh my goodness, this might be my favorite video so far because these are so darn cute and cuddly. Target has so many adorable socks in the kids aisle (anyone find the Cat & Jack line just the best thing ever??) I think we will make lots of these for gifts in the future. We've already had requests. Enjoy the tutorial! Pretty please, if you make one, show me! Tag me on Instagram @nikkischreiner or email me pics or something! I love to see. After making that video, we went to Target that very day to buy socks for more monkeys. Kelby's turned out super cute! We're still working on Natalie's, but it's going to be equally adorable. I have an online acquaintance down in Australia named Trixi and around October last year, she asked to interview me for a series of posts about sewing teachers! She posted that interview on her blog yesterday, which you can read for yourself if you want. She's doing a great job on the series about sewing teachers, so you should definitely subscribe to her blog. I feel so honored to be featured on someone else's blog, so I wanted to give Trixi a shoutout here in return. I'm pretty sure I first became aware of Trixi's blog, Coloured Buttons, on Instagram. As a sewing teacher looking for ideas on patterns, projects and how other people do things, I found her website and Pinterest page to be a wealth of ideas! I quickly bought her ebook, Sew Together, Grow Together, and was thrilled with the ideas! Remember these adorable speech bubble magnets from one of my classes? That's Trixi's idea! My daughter Layla really loves making little softies and has been inspired by this ebook many times over, it's so sweet. You can find the book here on Amazon. Please go check out Trixi's ideas, it's a feast for the eyes! Everything is just so fun and colorful. I'm so excited to have our next YouTube video tutorial up and running! Learn to make a cool shirt or cover-up out of a scarf. We plan to go to our thrift store for more scarves to play with because these are so fun and easy. Happy Valentines Day! We had a couple Valentine themed sewing classes this past weekend and even though my Valentine is two oceans away, I still love getting in the spirit! I always plan two projects for my three hour classes, one more time consuming one and one for the extra time we may have. I thought sewing felt hearts onto actual paper cards would be fun for our extra time project and my students really got into it! I had some heart patterns from our bigger project and I also got a few stamp phrases and ink pads out for them to use, plus a couple letter sets so they could make their own words. All the girls got so creative with these! Our main project for this class, though was Valentines zipper pouches, using this tutorial on The Polka-Dot Chair. Zippers and boxed corners were new techniques for them and they did such a great job! These were a really fun project and I always love how differently everyone's turns out! Kids are so creative. Our newest video tutorial is up! 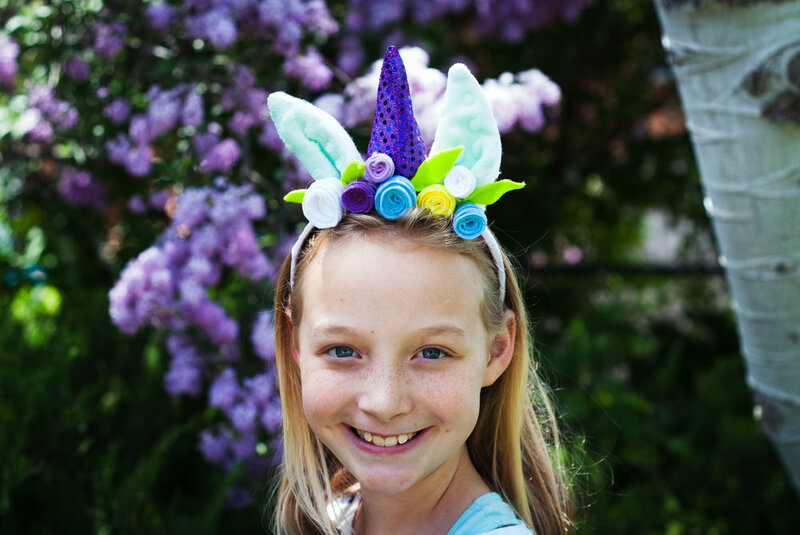 Layla and I are going to show you how to make soft headbands in any size. My girls are really loving these and they're sooo easy. I hope if you make some, you'll show me by commenting here or on YouTube or tagging me on Instagram! I would truly love to see. I made some little baby bibs for a baby shower recently and decided to make a video tutorial, as beginner friendly as I could make it, showing others how to make them too! I've included a free pattern if you scroll down, AND I've shown you in the video how to adjust this pattern to any size! I've been making these for many years, I'm pretty sure I traced a baby bib I had at the time for this pattern. They make great little gifts and they're so easy! A few links to supplies I refer to in the video (these are affiliate links and while I wasn't paid to recommend them, I truly love and use these items and do earn a small percentage should you purchase them through these links). Wonder Clips! These are awesome, I use them all the time, wish I'd had them sooner. And the snaps. These come in all kinds of great colors, but also in white. And here is the free pattern. Just right click on the image below, save to your desktop and print. Be sure and click "fill page" on your printer settings, otherwise it may print a bit too small, because printers like to add borders and this pattern took up the whole page from edge to edge! If you can think of other baby item tutorials, you'd like to see video tutorials on, will you let me know in the comments? And if you make some bibs using this pattern, I'd love to see them! A new tutorial is up on the Pin, Cut, Sew YouTube channel and this one contains plenty of family antics as I teach my girls to make cute tassels with their old t-shirts. Tune in and please subscribe to our channel!! I'm discovering there is a whole world of sewing vloggers out there that I didn't even know about! I plan to create a blog post about some of my favorites in the near future. Until then, enjoy making some t-shirt tassels and then tell me, which kinds of sewing projects would you like to see a video tutorial of? Textured t-shirt Technique and YouTube announcement! Anyone can sew! Kids included. Any age is a good age to start. Anyone can sew with basic equipment. 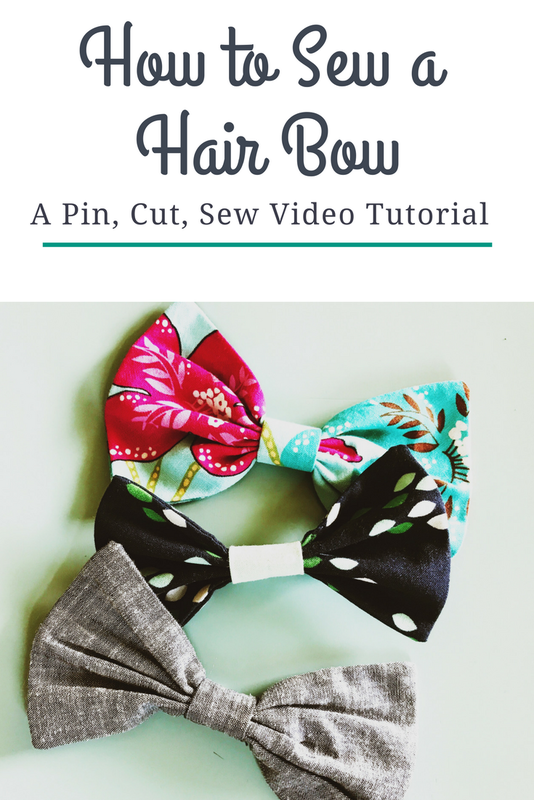 Please subscribe to our channel and tune in for weekly how-tos, tutorials, tips and general sewing news! 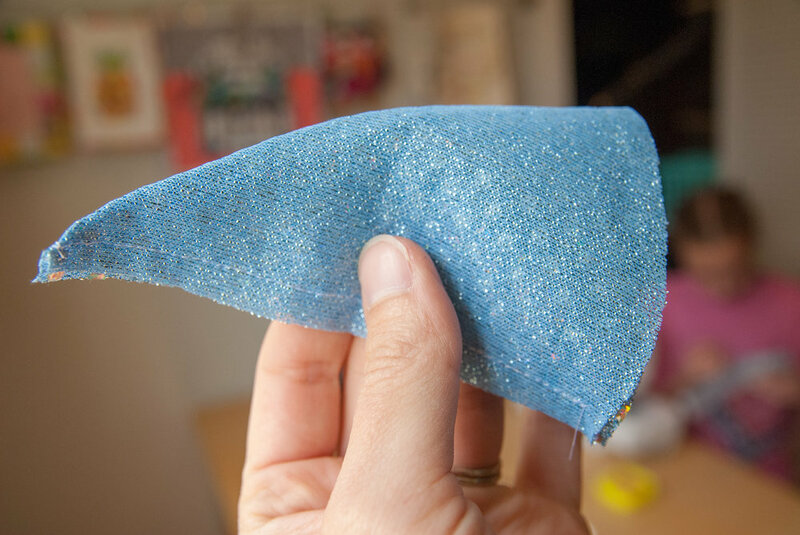 My first video is a fun tutorial on making textured DIY scrappy t-shirt fabric. Enjoy! Sewing is for boys too! I had the pleasure of having a pair of brothers in my Christmas stocking sewing class last week! This isn't the first time I've had boys and of course I've taught my own son too and every so often we plan a class that Kelby really wants to join in on, like the emoji pillows (click here for my free templates for those!) . He made several of those, he loved it! We also designed a Minecraft Creeper pillow for the only boy in one class. I should really do a tutorial on that. These boys chose some great hunting fabrics for their stockings and they turned out so cool! Beyond that, I really couldn't find much at all geared toward boys and sewing!! Plenty out there for women to sew for their boys, but that's not what we want this time. I guess I need to get cracking on that Creeper Pillow tutorial! But, I still want to help, so I'll tell you some of the things Kelby has enjoyed sewing or would like to sew. First up, he loves his handmade pillow cases and really likes picking out fun fabrics and even made one himself. One time we used an old t-shirt of Casey's and Kelby and I collaborated on a little t-shirt tote bag for him. He loves it and calls it his gamer bag because the shirt had a bunch of gaming controllers on it. Here he is working on it. I can't find the finished project photo, darnit! Boys also like these name buntings. They are so customizable if you just change up the fabrics. I had a boy at class who chose an Army fabric for his and it turned out super cool. And here's Kelby's out of that same Star Wars fabric! I'll leave you with the precious video that had me in tears! I love it so much.